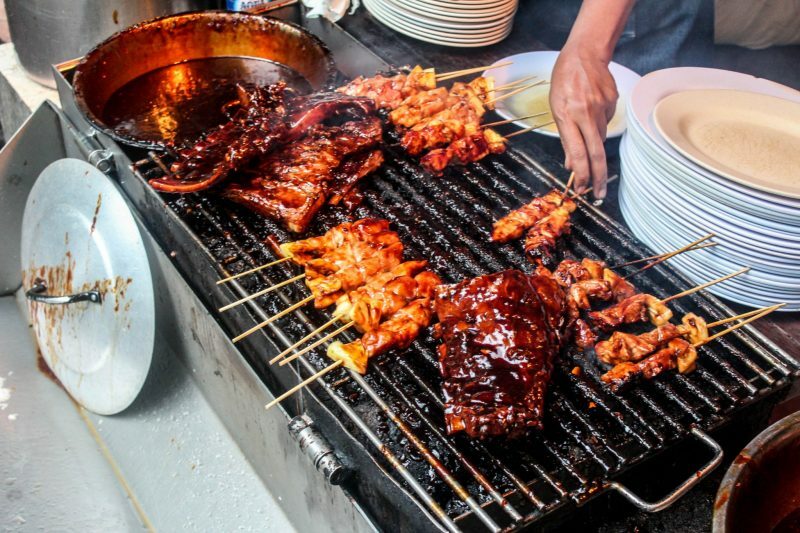 You can’t go to Bali without having good food, period. 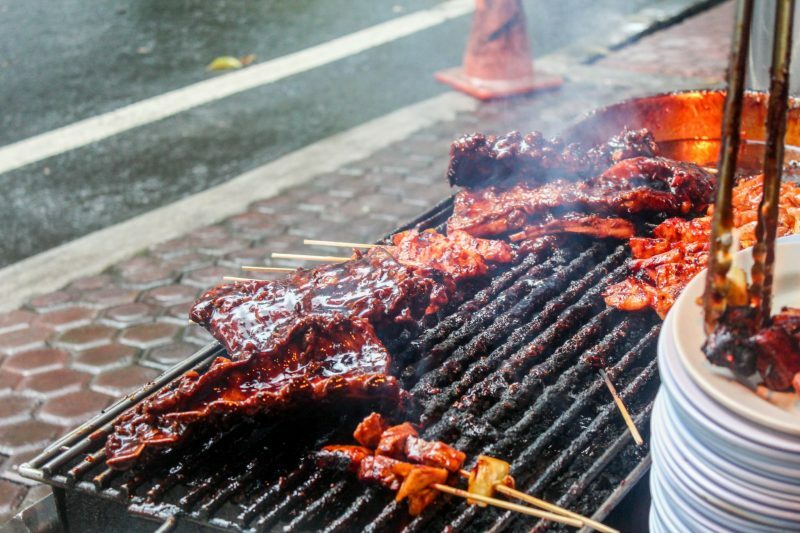 As a part of Indonesia and like the rest of Indonesia, the food is not gonna disappoint you. If you ever come to Indonesia you will know what I mean. This guy knows..
Indonesian cuisine is soo rich in spices and taste. From the street food, cafes, bars, to some posh restaurant, you gotta love the food here. But one thing that set Bali different is actually what you can’t eat. The Bali island’s inhabitants are predominantly Hindu and culinary traditions are somewhat distinct with the rest of Indonesia. According to Hindu belief, cows are considered sacred. Hence why in Bali beef is never or rarely consumed. 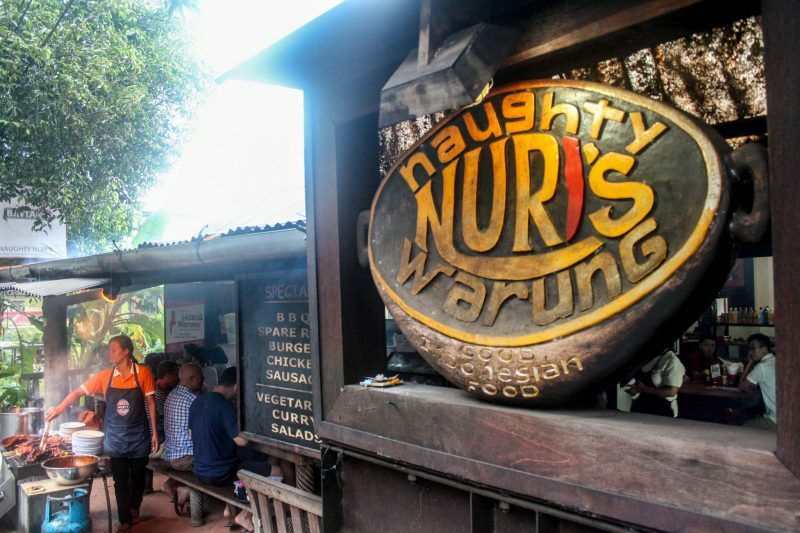 Naughty Nuri’s is well known for its pork ribs since back in the days and it all started in Ubud. They now have already opened a couple of outlets outside of Bali, with the recent opening in Singapore. But the rumors said that it was not the same as the original one in Ubud. I haven’t tried the other outlets they have but I am a firm believer that the original supposed to be the best, hence why we went all the way to Ubud to eat this stuff. It took almost an hour from the southern part of Bali. Ubud is known as one of Bali’s major arts and culture centers. The area is also famous because of its surrounding, rainforest and terraced rice paddies. A place you will go if you want to seek inner peace, sort off. So other than the city center, the rest of Ubud if pretty much consist of forests. To be honest, maybe because of that also it was quite hard to find this place. It was located out of nowhere, beside the long..long..straight road. We had all the help we can get from Waze and Google Map. Thanks, technology! The road was almost totally empty but it was hard to miss this place because there was a line of cars parking beside the road from all the people eating here. We went there around 3 pm. It was raining and the weather was slightly cold, a common thing in Ubud. It was already passed the prime lunch time but the place was still packed. Luckily a group of people just finished eating and we got our table. But even before coming in, what instantly caught my eyes was the ribs. They have the grill outside, smoking hot flaming grill with all the ribs and spices, oh soo mouthwatering! It took quite a while until we are manage to order something. Not because there were lots of things to choose from but because the service was kinda meh. Everyone just seemed to be running around inside that small place, making it more crowded than what it already was. Even though we were seated, no one approached us to get our order. So I went to the cashier to ask for their menu. She replied that somebody will help me just a moment and I can just sit down. Well, a couple of minutes later someone did come to take our order but that was not a good impression. And they also seem to be running out of stock pretty quick, it was only 3 pm but a couple of their menu is already sold out. My friend told me that their pork chops are also pretty good but it was already sold out also. Also, not the fanciest place.. The inside was pretty small and might look a bit shabby. I guess they want to stick with the “warung” theme because it means a modest small restaurant in Indonesia. It is open space, no air conditioning and it got quite hot inside even though it was raining outside. Also, because the grill was just outside the inside was actually filled with smoke from the BBQ. Enough to make everything looked foggy and it was kinda dark inside which you might tell from my picture. 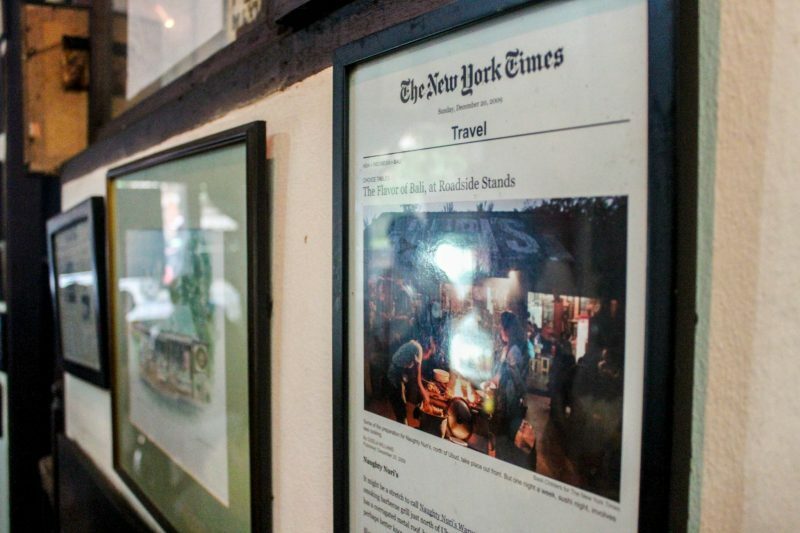 But once you looked past the shabbiness, you can see most of the frame hanging on the wall was filled with clipping that featured this place either from magazine or newspaper. There are pretty proud of their business, it felt like going into somebody home and seeing their family photo on display. Other than that, hanging on the wall is also their menus and random stuff. The good thing that they still had their ribs and their ribs redeem everything, thank God! The ribs were juicy, the meat just falling off the bones, soo tender, and sticky glistening sauces. I think what made them super good is how the meat soaked all the sauces, not just slathered on the outside. The ribs portion was big enough for 2 people, so I share it with my friend. It cost me around IDR 150,000 for half the ribs (since I am sharing for both of us), fries and drink. 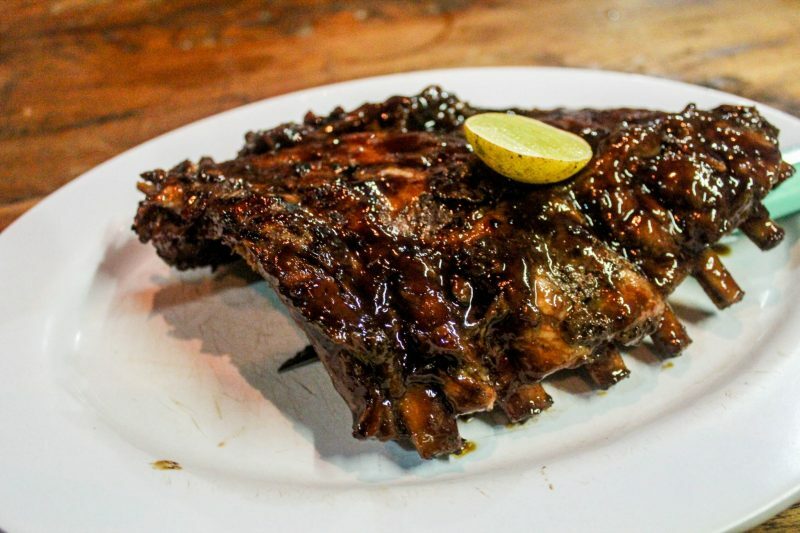 The ribs itself cost almost IDR 100,000 per portion which with that amount of portion is totally worth every rupiah. To be honest, it is not the most expensive ribs compare to other places and it was soo good. Because the place was small, we didn’t hang around too long after done with our meals. The place was not suitable for hanging out anyway and we didn’t want to make others that just come wait too long for their table. Yes, we are a sensible person like that. It was not as packed as we first come but there were still people that just came when we left. 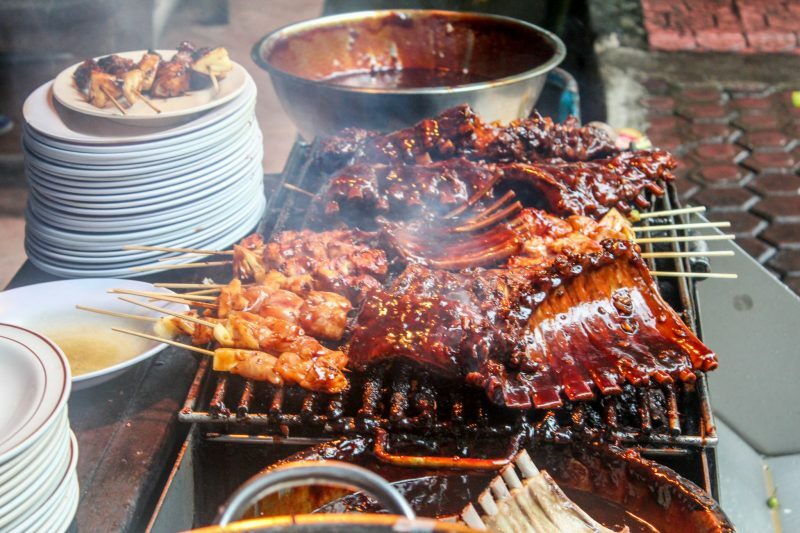 We even joked around that we might go to Bali just to eat this ribs again. You got the point, it was that good. I would highly recommend you guys to try this place, don’t expect much about the service or place but just come for the ribs. I had lots of good food in Bali but this is definitely the highlight for me this time. And we haven’t started about the seafood yet. Bali, island, sea, of course, there will be great seafood. Not to mention the bars, and cafe craze that is happening lately in Bali. Also street food, the cheap and the good. 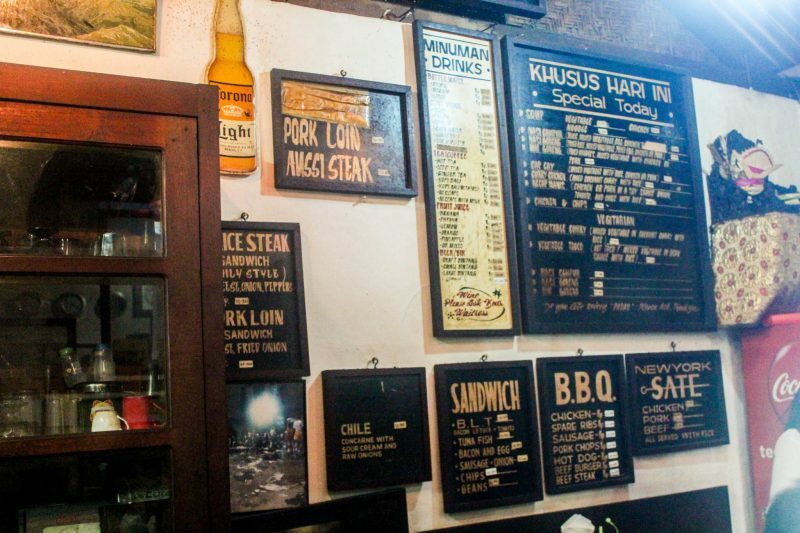 Oh yeah, there are seems to be quite a discussion about Nuri’s vs Wahaha as the best pork ribs in Bali. Well, I haven’t taste Wahaha’s ribs so I can’t give my judgment on that. Have you tried both of them? Which one you prefer? Anyway if you missed the last post about Bali series, you can check it here which is about watersport. Read it to redeem yourself after all the #foodporn in this post. Thanks for share and reading. Until next Bali post, see ya!